Why is it important to consider the shape of an object when determining the object's angular momentum? The shape determines the location of the center of mass. 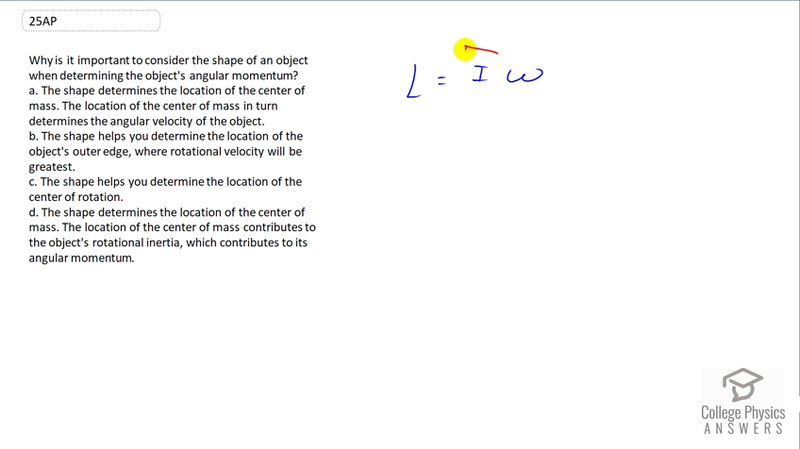 The location of the center of mass in turn determines the angular velocity of the object. The shape helps you determine the location of the object's outer edge, where rotational velocity will be greatest. The shape helps you determine the location of the center of rotation. The shape determines the location of the center of mass. The location of the center of mass contributes to the object's rotational inertia, which contributes to its angular momentum. This is College Physics Answers with Shaun Dychko. The angular momentum of an object equals its moment of inertia multiplied by its angular velocity. So anything that can change moment of inertia will change angular momentum. Now the location of the center of mass has an effect on the moment of inertia because there is something called the parallel axis theorem that you haven't actually learned in this textbook but it says that the total moment of inertia of an object will equal the moment of inertia about the center of mass, assuming that there's an axis of rotation at the center of mass. But if that axis is not at the center of mass you have to add the moment of inertia due to the center of mass and so you take the mass multiply it by the position of the center of mass squared. So when you change the shape of the object you're changing the position of the center of mass, you're changing this r term or factor. So you're changing this term which in turn changes the moment of inertia in total. You can see this theorem -- this is called the parallel axis theorem -- you can see it in action when you look at the formulas for a thin rod. So I'm looking at figure ten dot twelve in the textbook, it might be different in the pdf but you have this formula for a thin rod with an axis of rotation at its center. Its moment of inertia is m l squared over twelve, there's the length of l, and that same rod with an axis of rotation at the end has a different formula and it will be m lsquared over three. Let's say this is moment of inertia with axis of rotation in the center so we put c for center and here we'll put i subscript e for end. What I'm saying up here with the parallel axis theorem is that the moment of inertia of this system will be the moment of inertia about an axis of rotation about the center of mass. This axis of rotation is in the center of mass, in the center of this rod and so this is the only part that matters. You don't have an m r squared m r c m term squared at all because the distance from the center of mass to the axis of rotation is zero in this picture. But then in this picture, we have the center of mass a distance lover two away from the axis of rotation. So we're going to test this theorem by calculating i e using it. So i e will be the moment of inertia as though the axis of rotation was at the center of mass and we're given that here already so we'll write that down, m l squared over twelve and then add to that the moment of inertia of the center of mass. So that's going to be the mass multiplied by its distance next to the location which is l over two and we'll square that. So this makes m l squared over twelve plus m l squared over four because two squared is four and then to get a common denominator you get m l squared over twelve plus three m l squared over twelve multiplying top and bottom by three here. This makes four m l squared over twelve which four over twelve is one over three, so we've m l squared over three and there we have it. We have derived this formula which we're given but now we've figured it out based on this parallel axis theorem given this plus the moment of inertia of the center of mass. So all that to say that moving the center of mass by changing the shape of the object has an effect on the moment of inertia. The answer is D.